As much as I'd like to make it my life's mission to try out every liquid lipstick there is out there I wasn't planning to try any of Maybelline's new Vivid Matte Liquid lipsticks. But for some reason I decided to swatch them in store one day and I kinda had to have Berry Boost. I walked away but of course I couldn't stop thinking about it so I had head back to get it. So there you go. The Maybelline Vivid Matte Liquid's come in a square shaped tube with a black lid and a see-through lower half so you can see the shade of the lipstick. You unscrew the lid to reveal quite a long doe foot style fluffy applicator. The applicator itself is pretty good and I find it allows quite precise application, although as with any product like this you do need to be careful when applying it. There is a very slight scent to this one but I'm not quite sure what it is. It's not a fruity or vanilla type scent, more like slightly plasticy, but it's very subtle. The shade is a lovely slightly darker red berry shade and as I said I kind of fell in love with it when I swatched it in store. I really wanted to love this but the problem I have is that it doesn't actually dry down. 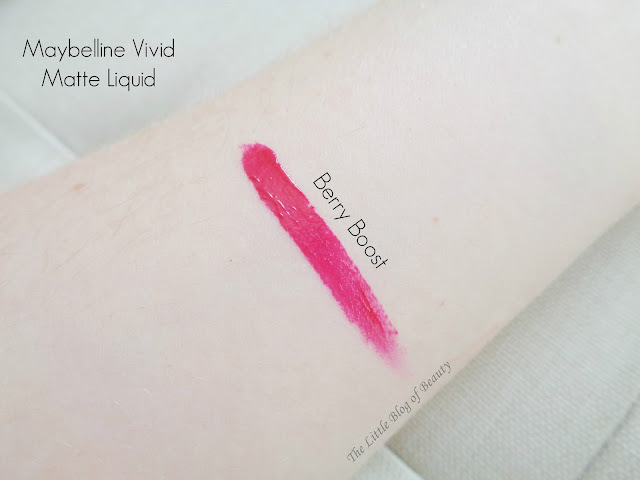 When I think of liquid lipsticks I always assume that they dry down to a true matte or at least velvet or satin finish that then can't budge, unless of course they flake off. But this stays liquid and this then means that there is a high potential for accidentally smudging it across my entire face. I also can't really see how a product is matte when it doesn't dry down because this then means it still has a least a little bit of a gloss finish to it. So as much as I do like this product I won't be picking up any further shades because I would much prefer if it dries down and effectively 'sets' on the lips. Have you tried any of the Maybelline Vivid Matte Liquids? Lovely shade, although its a shame youre not a fan of the finish! I haven't tried any of these yet but I do love the colour. They sound quite similar to the Revlon HD mattes, they dont quite dry down either ( I am a big fan of those though).